Michael Mahan at Worth Avenue Yachts sends news of a further $345,000 price cut on the 34.14m motor yacht Domino, jointly listed with Simon Gibson. Built by Westport as one of its 112′ series in 2005, Domino has had just two owners who’ve kept her regularly upgraded and maintained. An interior in rich satin cherrywood accommodates eight guests in a master suite, VIP stateroom and two twin cabins while twin 2000hp MTU engines give her a cruising speed of 20 knots. 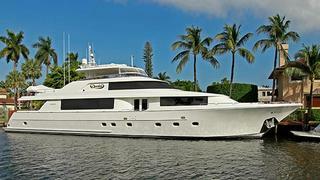 Located in Fort Lauderdale, Domino is down from $6,795,000 to $6,450,000.